The 11th ASEF Journalists’ Seminar (ASEFJS11) is a continuation of the ASEF Journalists’ Colloquium series. It was organised from 17-22 November 2017, in conjunction with the 13th ASEM Foreign Ministers’ Meeting (ASEM FMM13) in Naypyidaw, Myanmar. The theme for the 11th ASEF Journalists’ Seminar was “Shaping Public Perceptions and Minds towards Achieving the SDGs”. While journalism has traditionally focused on covering conflict and societal challenges, Constructive Journalism could potentially pave the way for greater awareness and support for the Sustainable Development Goals (SDGs), through a focus on the achievements and success stories they have produced. Participants of ASEFJS11 therefore explored how media outlets and journalists can contribute to shaping positive perceptions and mindsets among ASEM societies about sustainability and the achievability of the SDGs. ASEFJS11 provided a unique space for journalists and reporters from Asia and Europe to exchange ideas, good practices, and challenges they face in reporting on sustainable development. A total of 23 international and 12 local journalists from Myanmar took part in the seminar. During the core part of the seminar (18-19 November 2017), participants engaged in panel discussions and workshops, adressing the broader theme through the prism of Environment, Education, and Culture, and how media can cooperate with each of these sectors to enhance awareness and action on the achievement of the SDGs. The second element of the ASEFJS11 Programme consisted of media coverage of the 13th ASEM Foreign Ministers' Meeting (ASEM FMM13). The seminar participants received accreditation to the ASEM FMM13 venue and were granted access to the Opening and the Press Conference of the meeting. ASEFJS11 aimed to broaden the perspectives and understanding of journalists from the ASEM region on the media landscape across Asia and Europe with regards to sustainability reporting. Furthermore, it provided a unique space for journalists from both regions to network and discuss possible initiatives for cooperation in the future. The 11th ASEF Journalists' Seminar (ASEFJS11) took place on 17-22 November 2017 in Naypyidaw, Myanmar, in conjunction with the 13th ASEM Foreign Ministers' Meeting (ASEM FMM13). The Seminar, held on a biennial basis, provides a platform for dialogue and informal networking between journalists and professionals from Asia and Europe in the field of media. The official partner for the Seminar was the Ministry of Information of Myanmar, who provided the venue and logistical support throughout the event. International journalists and reporters representing 23 ASEM partner countries, along with 12 local journalists from Myanmar, gathered to discuss the role that media can play in supporting sustainable development. The Seminar, themed "Shaping Perceptions and Minds towards achieving the SDGs", focused on using Constructive Journalism as a tool for raising awareness on the positive examples and success stories linked to the implementation of the United Nations' Sustainable Development Goals. The core programme consisted of 2 days of panel discussions and workshops, addressing the main theme through the prism of Environment, Education, and Culture, and how the media can collaborate with these sectors with respect to the SDGs. The participating journalists were accredited to attend and cover the 13th ASEM Foreign Ministers' Meeting (ASEM FMM13), providing them with first-hand exposure to the official ASEM process. The 11th ASEF Journalists’ Seminar is a continuation of the ASEF Journalists’ Colloquium series. It will be organised in conjunction with the 13th ASEM Foreign Ministers’ Meeting (ASEM FMM13) in 2017 in Naypyidaw, Myanmar. The theme for the 11th ASEF Journalists’ Seminar is “Shaping Public Perceptions and Minds towards Achieving the SDGs”. 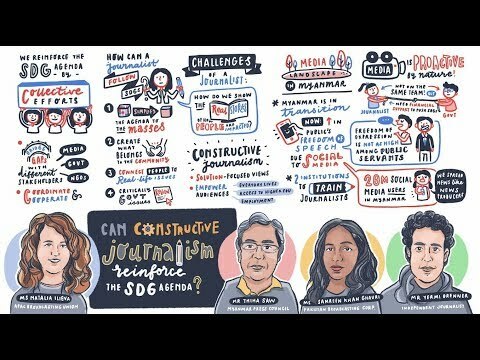 While journalism has traditionally focused on covering conflict and societal challenges, Constructive Journalism could potentially pave the way for greater awareness and support for the SDGs through a focus on the achievements these have accomplished to date. The ASEFJS11 will therefore in practice explore how a Constructive Journalism-based approach to reporting can be utilised by media houses and journalists to shape positive perceptions among ASEM societies about the SDGs and their achievability by 2030. A 3rd ASEF Media Handbook will be produced to document the discussions. It will serve as a practical reference on sustainability reporting for journalists from ASEM countries. Look out for the Call for Application on ASEF web!